Denise Duhamel's most recent poetry title Two and Two (University of Pittsburgh Press, 2005) is the winner of Binghamton University’s Milt Kessler Book Award. Other titles include Mille et un Sentiments (Firewheel, 2005), Queen for a Day: Selected and New Poems (Pittsburgh, 2001) and The Star-Spangled Banner (Southern Illinois University Press, 1999). 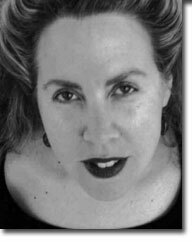 She co-edited, with Maureen Seaton and David Trinidad, Saints of Hysteria: A Half-Century of Collaborative American Poetry (Soft Skull, 2007). Her poetry is at home in such diverse anthologies as Bum Rush the Page; Aloud: Voices from the Nuyorican Poets Café; and The Best American Poetry. Duhamel has read her work on NPR and as a featured poet on the PBS special Fooling with Words, hosted by Bill Moyers. A recipient of a National Endowment for the Arts Fellowship, she is an Associate Professor who teaches creative writing at Florida International University in Miami.